I was fortunate enough to be given (for free!) two barely-used 105 AH/20 hour rate AGM deep cycle batteries. They were gorgeous. How often does $400 worth of batteries just fall into your lap? The problem: I already have a string of flooded batteries for my solar set up, and you can't just add random mismatched batteries to the end of the string. The quick solution was to create a new string with the new batteries and place a simple single pole, double throw switch between them on the + side.. It's very easy and inexpensive, but then I limit myself to manually switching between strings for both charge and discharge functions. It would work, but there's got to be a better way. 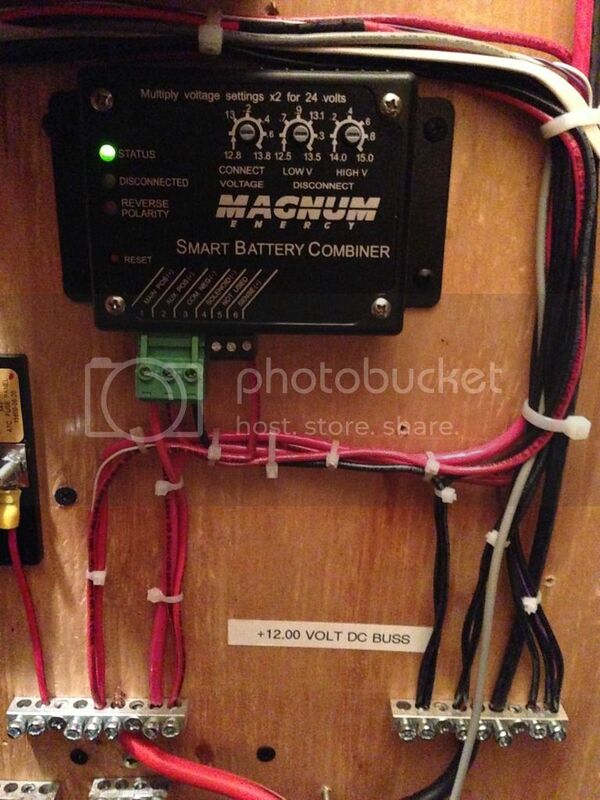 One evening I was wandering around my favorite solar supplier's website http://www.solar-electric.com and by accident found the Magnum Energy battery combiner. It looked like the answer to my problem. The ME-SBC goes between two batteries and allows them to charge each other without being directly connected, with user-adjustable high/low. If the voltage in either battery exceeds your set points, the device disconnects. It really is a set-and-forget system. For prepping/survival purposes, you could have one string of "good" batteries and use the ME-SBC to add miscellaneous salvage batteries to your system without pulling down your good ones. I see two main disadvantages: First, it is an electronic device that adds a layer of complexity to your system. If we get into a long term survival situation where spare parts are extinct, I may wish I had that low-tech SPDT switch. Second, this device does not allow you to power a load directly from the secondary battery. All it does is allow the batteries to charge off each other. The MB-SBC does not increase your battery capacity, it increases your battery charging capacity. It's a subtle difference, but it matters. The ME-SBC is not a complete solution, but at only $120 it's a relatively inexpensive way to add versatility to my solar power system. I might write up a more detailed review and post it on my blog. I also have tried 2 separate charge controllers going to separate battery sets and they are run off of the same panels, and it seems to work, but not ideal. spacecase0, I have EMP concerns too. But any EMP strong enough to take out this device will probably kill my controller and everything else too. So ruling out the splitter on EMP grounds does not make much sense. You can install this affordable manual switch http://www.solar-electric.com/basw1300amp.html and eliminate the need to move plugs around. As best I can tell, the ME-SBC will not split a load because the secondary battery string is connected to the positive of the main string through the device. This would result in pulling current through the device from the main battery. The other option, running a lead form the + side of each string directly to to a common buss, would essentially be shorting around the splitter and defeating the purpose of having it. It's a lot easier to visualize what I'm talking about if you look at the connection diagram in the manual (available on line through the link in my last post). I was hoping to split the load too, and Magnum Energy tech support did not respond to my emailed question asking about it. I cannot figure it out. If anyone has any ideas, please speak up. By the way, the ME-SBC has a limit of 25 amps but there is an output to operate a relay if you need to switch more juice.